Brushing up on Mouth Care is a suite of open access resources that supports optimum daily mouth care for those who may be dependent on others for their care. These resources were developed as part of a research project at Dalhousie University that examined oral care in a number of continuing-care settings in Nova Scotia. This has been a true partnership. A team of oral health researchers worked hand in hand with personal care providers, licensed practical nurses, nurse managers, directors of care as well as many other continuing care advocates representing residential care facilities, home support agencies and Caregivers Nova Scotia. Together we developed all of the user-friendly print, video and web-based materials you will find on this website. In 2016, the Continuing Care Branch of Nova Scotia’s Department of Health and Wellness, released their Long Term Care Program Requirements: Nursing Homes & Residential Care Facilities. This provincial policy document includes guidance for oral care, including specific requirements for assessment and care planning. These guidelines are similar to many other provinces in Canada and regions beyond. 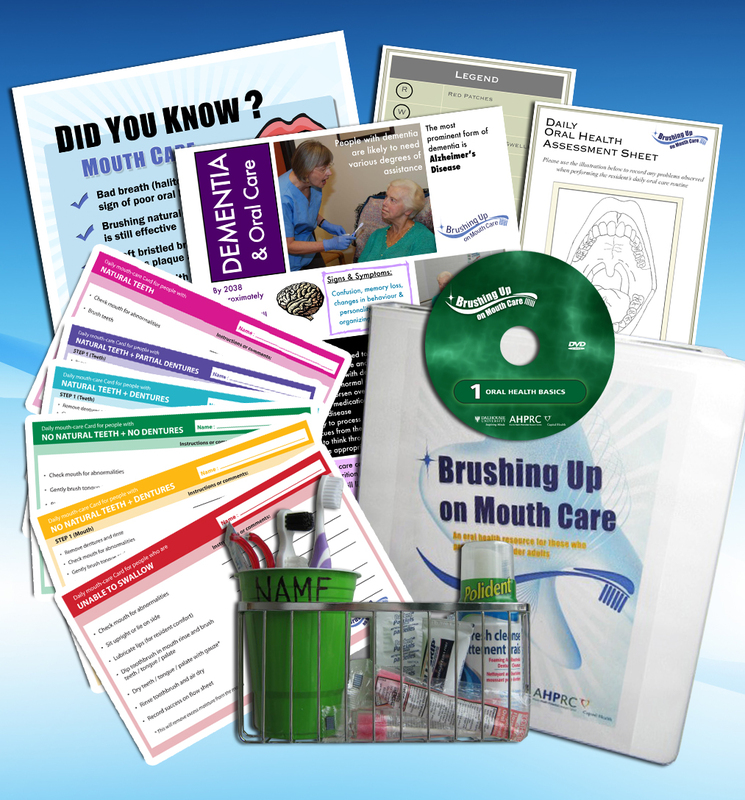 Whether it’s building an oral health toolkit, getting advice on dementia care, or teaching others we hope these resources will provide everything required for meeting the highest standards for daily oral care. These resources are also helpful if caring for a loved one at home. Our partners at Caregivers Nova Scotia have additional supports to help with all aspects of caregiving. Good oral health is important for staying healthy at every stage of life. Our focus on older adults came from research indicating that many older adults have high rates of oral disease and poor oral hygiene. This is especially true for those who rely on others to help with their personal care needs. Oral diseases can lead to pain, discomfort, an inability to chew and swallow, and can even cause people to remove themselves from social activities. Poor oral health can also have a negative impact on nutrition status and other health concerns such as diabetes and aspiration pneumonia. While it is fortunate that people are keeping their natural teeth throughout their lifetime, it also results in challenges. We hope that these resources will help to ensure that daily oral health care needs can be met. The research and the development and maintenance of this website is supported through the Healthy Populations Institute, a Senate-approved research Institute at Dalhousie University since 1993. Through excellence in research, capacity building, and knowledge translation, HPI has been a leader in health promotion research in Atlantic Canada and beyond. We are also grateful to the many groups who have provided guidance and who have helped us spread the word about Brushing Up on Mouth Care. In particular, we wish to thank the Nova Scotia Health Authority Eastern Shore Tri-Facilities; Nova Scotia Community College – School of Health and Human Performance; Health Association of Nova Scotia; Northwoodcare Incorporated; Nova Scotia Department of Health and Wellness – Continuing Care Branch; Nova Scotia Department of Seniors; Nova Scotia Group IX Seniors’ Organizations; and the Nova Scotia Dental Association.